The Florida DOE, Career and Adult Education, and ACE of Florida are pleased to unveil the new statewide Official Florida Adult Education Program logo for branding and marketing purposes. This logo provides a distinction for our public adult education programs. Once adopted and used statewide, this logo will signify a unique name and image for our adult education programs. You will notice the tagline of “Official Adult Education Provider.” Individuals wanting to update their skills and earn a high school diploma or equivalent have many options to choose from, so let’s help them understand the quality and accountability represented in our “official” programs. All programs utilizing this logo offer adult education programs that are supported in part or fully with state and federal funds by the Florida Department of Education. Programs follow state adopted curriculum frameworks that include college and career readiness standards. The frameworks are approved annually by the State Board of Education. Each program has the mission of serving students so they achieve the knowledge and skills needed to earn their high school diploma or equivalent, continue their education or training in postsecondary education, and/or for employment. Low tuition rates from $30 per term to $45 per semester make these programs very affordable. There are many ways you can begin using the new logo so that it is recognizable in your community and potential students know this is a program in which they can trust. Only by repeated use will this logo gain any traction and be connected to official adult education programs. We hope you will put this new logo to work by placing it with your email contact information, website headers, all social media (Twitter, Facebook, YouTube), blogs, business cards, letterhead and envelopes, posters, and other means used to encourage student recruitment and retention. You may also contact the ACE office and we will be happy to send you the file. Thanks to Jeff Arnott, Director, Adult Education, Brevard County Public Schools for his idea for this statewide logo and for heading up the Statewide Adult Education Branding and Recruitment Committee. Also thanks to members of the committee which include: Valorie Boyd, Executive Director, ACE of Florida; Shannah Kosek, Supervisor, Adult & Community Education, Clay County Public Schools; Susan Winters, Coordinator, Adult Education, Escambia County School District; Mary Bedford, President, Emergent Design and Development. A special thanks to Zelda Rogers, Director of Adult Education, FLDOE, Division of Career and Adult Education for her support of this initiative. 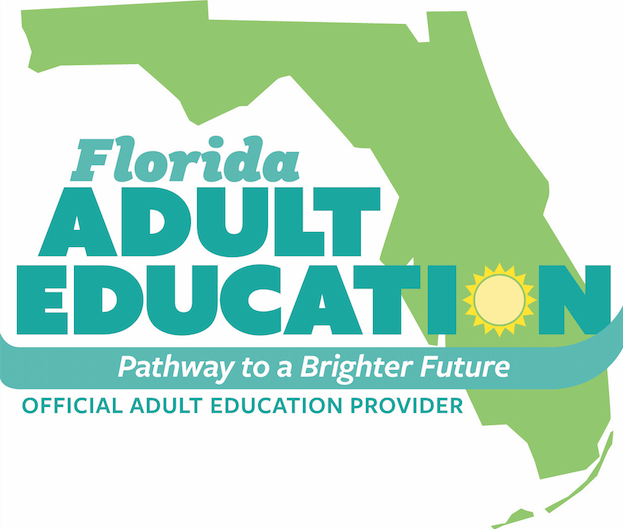 Let’s flood all of our adult education correspondence, branding and recruitment efforts with the Florida Adult Education – Pathway to a Brighter Future logo.